Petitioner :- Vinod Kumar Maurya And 6 Ors. Heard learned counsel for the petitioner and learned Standing� Counsel. The petitioners are claiming for consideration� on the post of� Trainee Teachers as against 10% reserved vacancy for Shiksha Mitra and have submitted that they has applied for the post of Trainee Teachers against 72925 vacancy in various institutions run of Basic Shiksha Parishad. Fourth and last round of counseling against 72825 vacancies as advertised on 30.11.2011 is over on 14.1.2015 and appointment letters are being issued to the selected candidates from 19.1.2015 onwards. The petitioners have filed present writ petition on 17.1.2015 after the final round of counseling is over. In view thereof, no� relief� can be granted� to the� petitioners.� The writ petition is dismissed. However, it is open for the petitioners to approach� respondent� No.3, in case, any� vacancy� exists� after the present�� process is over, in case the petitioners� approach respondent no. 3, he will consider and take appropriate decision. The petitioner belongs to General Male Science category in the selection for the post of Assistant Teacher in Primary School as against 72825 vacancies advertised in the year 2011. Submission is that the petitioner has secured 124 marks in T.E.T. Examination 2011 (Primary School). Accordingly, he has participated in the 3rd counseling, however, cut-off in the counseling was higher than the marks secured by the petitioner and hence he was excluded from consideration. 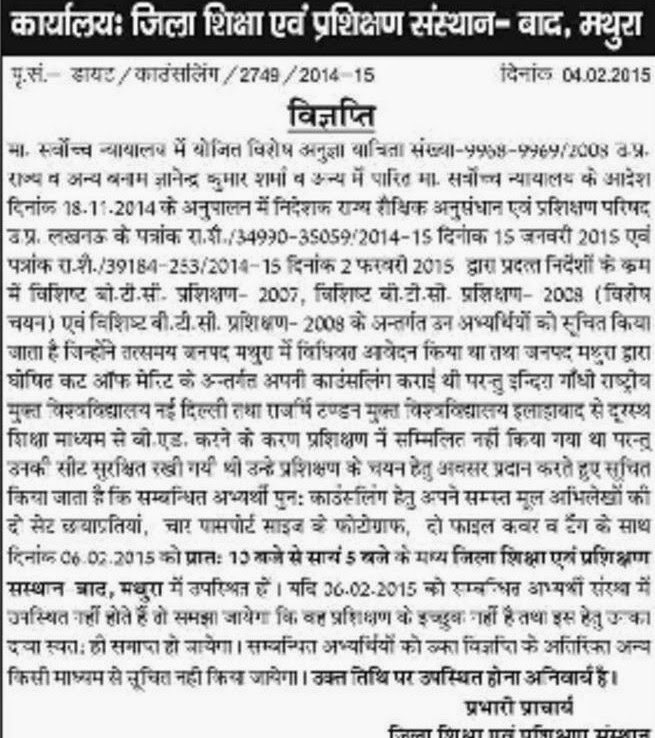 The petitioner has appeared for 3rd counseling in District Jalaun and could not participate in the counselling held in other districts as per the norms fixed by the respondents..
Submission of learned Senior Counsel for the petitioner is that in view of the circular dated 5.1.2015, the candidates having higher marks than the petitioner have been allowed to participate in the 4th round of counseling who have not appeared in the previous counseling. This has resulted in an anomaly on account of which, the candidates having higher marks than the candidates who had appeared upto 3rd counseling, were selected. As the petitioner has already appeared in the 3rd counseling, he could not participate in the 4th round of counseling for other districts. Now the petitioner came to know that the candidates having lesser marks than the petitioner have been selected in another District namely Sitapur. Submission is that the petitioner having higher marks than the last selected candidates, has right for consideration as against the vacancy existing as on date. 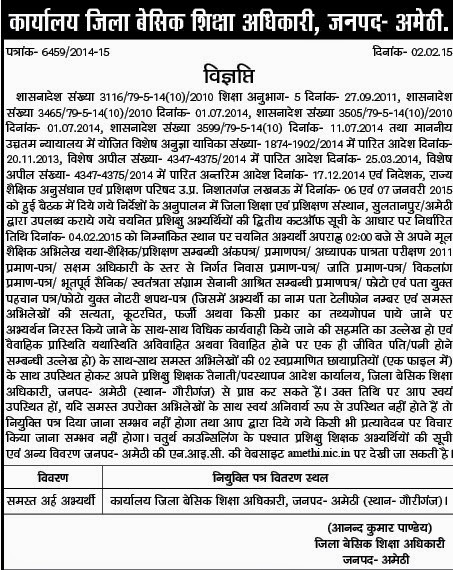 Only prayer of learned Senior Counsel for the petitioner is to direct the Director of Education (Basic), U.P., Allahabad, Camp Office, Lucknow to consider the claim of the petitioner for appointment on the post of Assistant Teacher as against 72825 vacancies, in case, vacancy exist as on date. To this submission learned Standing Counsel could not raise any objection. He submits that the claim of the petitioner can be considered by the Director of Education (Basic), U.P., Allahabad, Camp Office, Lucknow. Sri K.K. Chand, learned counsel has received notices on behalf of respondent nos. 4 & 6 and learned Standing Counsel for respondent nos. 1, 2, 3 & 5. In view thereof, the writ petition is being disposed of with a direction to respondent no. 2 i.e. 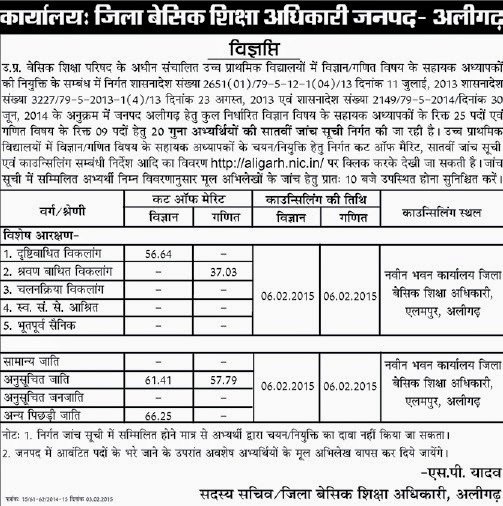 the Director of Education (Basic) U.P., Allahabad, Camp Office, Lucknow to consider the claim of the petitioner for appointment on the post of Assistant Teacher, as against the vacancy existing as on the date of consideration, after calling for the comments of the Principal, DIET. It is made clear that the petitioner's candidature can only be considered for the district for which he has applied. The entire exercise be completed expeditiously preferably within a period of three weeks from the date a certified copy of this order is produced before him. Respondent :- State Of U.P. And 8 Ors. The petitioner has applied� as against 72825 vacancies of Assistant� Teachers pursuant to the� advertisement�� issued in 2011.� The contention is that� the petitioner� possesses� requisite qualification� for appointment on the post of� Assistant� Teacher� and has participated in the�� counseling held in Gorakhpur, Siddharth Nagar, Sant� Kabir� Nagar,� Balrampur, Maharajganj, Basti and� Gonda (this assertion is narrated in paragraph� 14 of the writ petition). Unfortunately, the petitioner� met with an accident� on 30.9.2013 as a result of which, his both the legs have been amputed and he has become� 80% physically challenged.� The certificate has been given by� the� Chief� Medical� Officer,� Siddharthnagar on 15.11.2014.� Contention of the petitioner is that he met with an unforeseen situation and on account of� his physical condition, he is entitled for the benefit� which is being� given to� a physically challenged candidate. Learned counsel for respondent� Nos. 2� to� 9� is present in the� Court.� In view of the fact� stated in the writ petition, it appears that� the matter requires consideration at the ends of respondent� No.1 i.e. 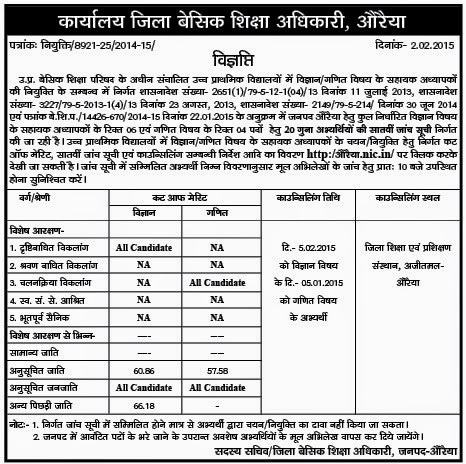 Secretary, Basic� Education, U.P. , Lucknow. However,� Learned counsel for respondent� Nos. 2� to� 9 submits that the selection process for appointment� as against� 72825 vacancies is already over and appointment letters are being issued to� the selected candidates� from 19.1.2015 onwards. Learned counsel for the petitioner submits that the petitioner's claim� may be considered,� in case, any vacancy� exists� for which he has appeared. 3. Entire exercise� be� completed as expeditiously as possible. PETITIONER HAVING MORE THAN 5 YEAR EXPERIENCE, BUT NOT AS PER RULE. Petitioner :- Pawan Kumar Mishra And 11 Ors. Heard learned counsel for the petitioners, Sri SK.Verma learned counsel for respondent nos. 2 and 3 and learned Standing Counsel for respondents for the State-respondents. The controversy involved in the present writ petition has been decided by this Court vide judgment dated 28.10.2014 in Writ Petition No. 3035 (S/S) of 2014, Priyanka Shukla Vs. State of U.P. and others wherein it was held that the services rendered by a teacher in any of the local area is liable to be counted for the purpose of determination of eligibility under Rule 8 (3) for promotion. However, it is clear that the seniority is to determined as per Rule 22(2) in case of incumbents who have been transferred from one local area to another or from one District to another. "Thus, the teaching experience gained by a teacher is liable to be counted under Rule 18, while considering his case for promotion. However, this itself will not entitle a teacher to be promoted as the same is to be granted on the basis of seniority list as per Rule 22 (2). In view of the above, I am of the opinion that the petitioners herein (except petitioner no.8, who admittedly does not have five years teaching experience) are also entitled for their case being considered for promotion in accordance with law by the Selection Committee, provided they are, otherwise, found to be eligible. This is of course, in order of seniority subject to rejection of unfit, as provided under Rule 18.Accordingly, writ petition is disposed of with direction to respondent no.4 to take appropriate action with regard to the claim of the petitioners for promotion in accordance with Rule 18, by counting their services rendered since date of their initial appointment, for purposes of teaching experience. In case the petitioners are not found entitled to be promoted, they shall be duly intimated. Writ petition stands disposed of subject to aforesaid observations/ directions." In view of the aforesaid facts and circumstances, this writ petition is disposed of in the same terms and conditions as contained in the judgment and order dated 28.10.2014 referred to above with the direction to respondent no.� i.e. 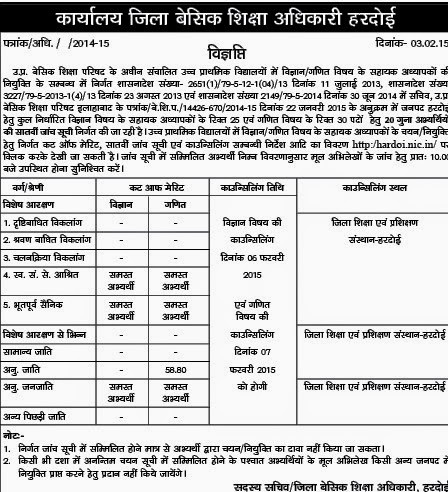 District Basic Education Officer District-� Farrukhabad to take appropriate action with regard to the claim of the petitioners for promotion in view of Rules 18 read with Rule 22, by counting� their services rendered since the date of his initial appointment, for the purposes of eligibility/teaching experience as expeditiously as possible preferably within a period of three months from the date of production of the certified copy of this order. Petitioner :- Anjani Kumar Pandey And Anr. Respondent :- State Of U.P. And 6 Ors. 1. Heard Shri Ashok Khare, Senior Advocate assisted by Shri Uma Nath Pandey for the petitioners. 2. By means of present writ petition, the petitioners have prayed for quashing the impugned decision of the State Grievance Committee dated 26.12.2014, and consequential order dated 13.1.2015 passed by Director, State Council of Educational Research and Training (SCERT) Lucknow. They have further prayed for a mandamus commanding the respondents to issue the appointment letters to them in their respective category being duly selected candidates along with all consequential benefits. 3. The State Government had issued a Government Order on 27.9.11 for filling up 72,825 vacancies of trained Teachers in Parishadiya Parimary Schools. The advertisement was issued on 01.12.2011 in daily newspaper 'Dainik Jagaran'. In pursuance to the aforesaid advertisement, the petitioners applied in different districts after completing the entire formalities. Both the petitioners, having graduation from duly recognised Universities and also having training qualification of B.Ed (Special Education) from U.P. Rajarshi Tandon Open University, Allahabad, have also passed U.P. 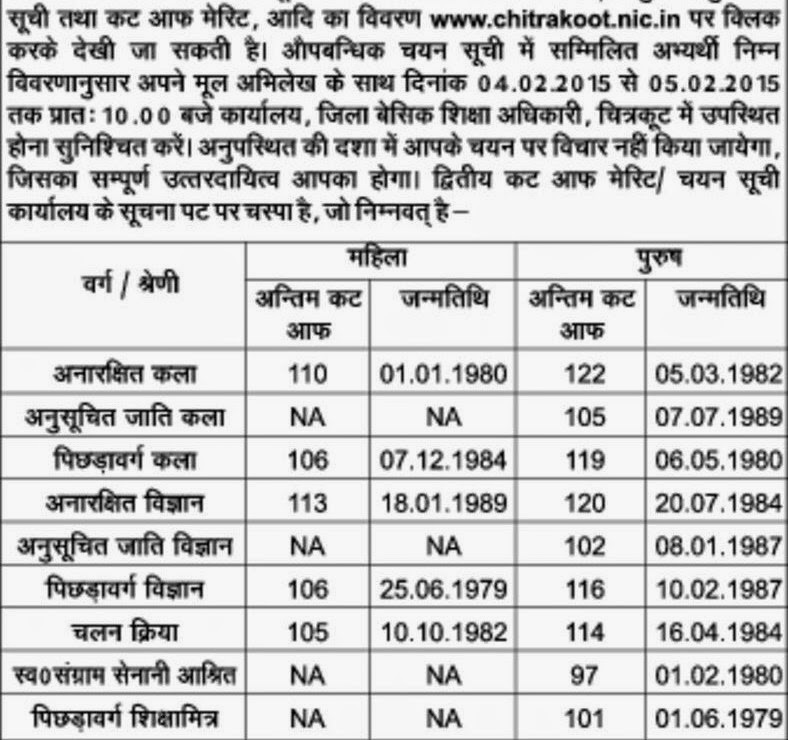 Teachers' Eligibility Test 2011 (Primary Level). It has also been averred in the writ petition that the B.Ed (Special Education) training given by the U.P. Rajarshi Tandon Open University is duly recognised by the Rehabilitation Council of India (RCI) and both the petitioners are duly registered with RCI. The relevant RCI certificates have also been brought on record as Annexure Nos. 7 and 8 to the writ petition. In pursuance to the advertisement the counselling letters were issued SCERT in favour of the petitioners. Thereafter the petitioner no.1 appeared in 3rd Counselling in District Siddharth Nagar being General, Male, Art candidate and the petitioner no.2 participated in 4th counselling in District Siddharth Nagar being General, Male, Science candidate. The district-wise chart has been prepared in which their names have been shown. 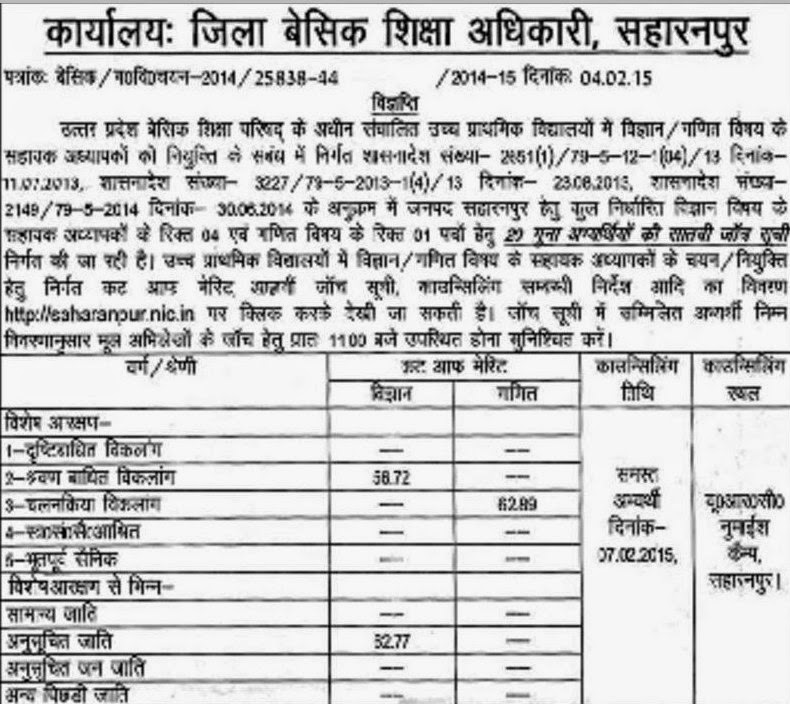 A controversy has been crept at the time of counselling where few applicants were not permitted to participate in the counselling on the basis of some Circular dated 27.8.2014 issued by the Director, SCERT, Lucknow in which B.Ed degree is mentioned but B.Ed (Special Education) has not been mentioned. Though the same was mentioned in the Government Order dated 27.9.2011, which categorically provided that the applicants, who had passed B.Ed (Special Education) could also apply. Certain amendments have also been carried out in between. 4. Shri Ashok Khare, Senior Advocate appearing for the petitioners submits that for appointment of teachers, guidelines issued by the NCERT are binding over the authorities. He submits that the petitioners fulfill the criteria laid down by NCERT with B.Ed (Special Education) and only on the basis of possessing B.Ed (Special Education) the petitioners were permitted to participate in the counsellings. In this regard he has emphasized the guidelines and notification dated 29.7.2011 and 30.5.2014, which clearly provide that candidates, who possessed B.Ed (Special Education) are eligible for appointment against the Assistant Teachers in Primary Schools. He further makes submission that the guidelines and instructions issued by SCERT are binding for appointment of Assistant Teachers in Primary School. "Heard Sri R.K. Ojha, learned senior counsel assisted by Sri S.C. Tripathi, learned counsel for the petitioner, Sri A.K. Yadav, learned counsel for the respondent No.3 & 4 and the learned standing counsel for the State. Sri R.K. Ojha with reference to provisions contained in the NCTE Notification dated 23.08.2010 as amended in the year 2011, the Government Order dated 27.09.2011 read with the Government Order dated 27.08.2014, the Division Bench judgment of this court dated 05.02.2014 passed in Special Appeal Defective No.130 of 2013 and a recent judgment of the Supreme Court dated 19.09.2014 passed in Special Leave Petitions (CC) No.12060-12061/2014 submits that in the selection in question, the B.Ed. holders have been allowed to participate, but, the petitioners who possess the qualification of B.Ed. (Special) which is a better qualification, are not being allowed to participate. He further submits that as per paragraph-2(kha) of the G.O. 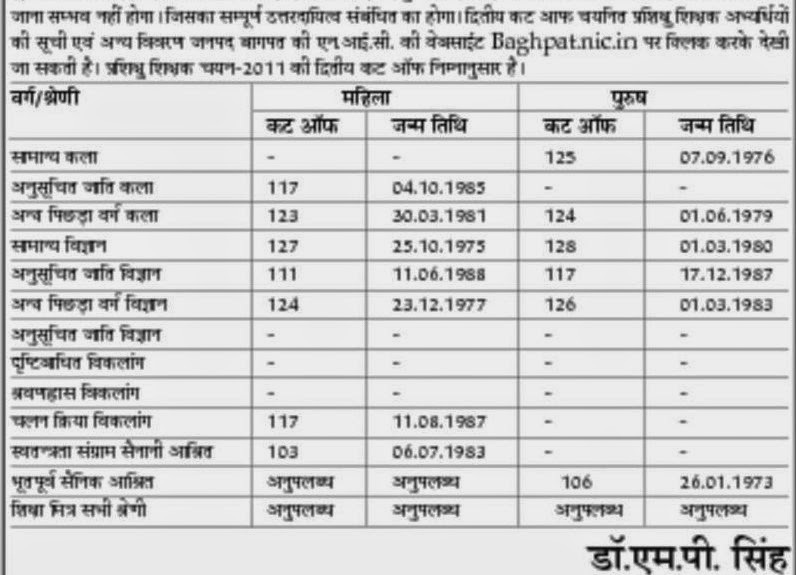 dated 27.09.2011, candidates having qualification of B.Ed. (Special Education) have been permitted to participate, subject to the condition that they would undergo a six months special training/ program after appointment and the G.O. dated 27.08.2014 has been issued in continuation of the earlier G.O. dated 27.09.2011. In spite of it, the respondents are not permitting the petitioners to appear in the counselling on the ground that they possess the qualification of B.Ed. (Special). Considering the facts and circumstances of the case, it is provided that the petitioners shall be allowed to appear in the counselling for the selection of Trainee Teachers of the year 2011, provisionally, subject to verification of their B.Ed. (Special Education) certificates by the concerned authorities. 6. Shri Ashok Khare submits that the similar controversy has already been decided by the Division Bench of this Court in Harsh Kumar's case (supra). It was assailed by the State Government by means of Special Leave Petition (C) No.12060-12061 of 2014 (State of UP and ors vs. Harsh Kumar and ors), which was eventually dismissed on 13.1.2015 by Hon'ble Apex Court and the judgment passed in Harsh Kumar's case (supra) has attained finality. He further apprised to the Court to the interim order� dated 30.10.2014 in Himanshu Mishra's case (supra) and no special appeal has been filed against the interim order and still the same is operative but ignoring the mandate issued by Hon'ble Supreme Court, the State Grievance Committee gave the opinion that the candidates, who possessed B.Ed (Special Education), are not eligible for appointment as Assistant Teachers against the selection of trained teachers, which is patently illegal and clear disobedience to the mandate issued by this Court. 7. In view of above, the matter requires consideration. 8. Learned Standing Counsel appears for respondent nos.1, 3, 4, and 6. Shri Ashok Kumar Sing has accepted notice on behalf of respondent nos. 5 and 7.� The respondents pray for and are granted a week's time to seek instructions in the matter. 9. As prayed, put up this matter as fresh on 18.2.2015. 10. It is observed that the respondents may carry out the selection process and� two seats would be kept vacant for the petitioners in their respective category. RAJASTHAN BTC CANDIDATE TRYING TO APPLY IN 15000 BTC TEACHER JOB. S.T.C. (two years) Examination-2009 from the State of Rajasthan. Submission is that the said course is equivalent to B.T.C. 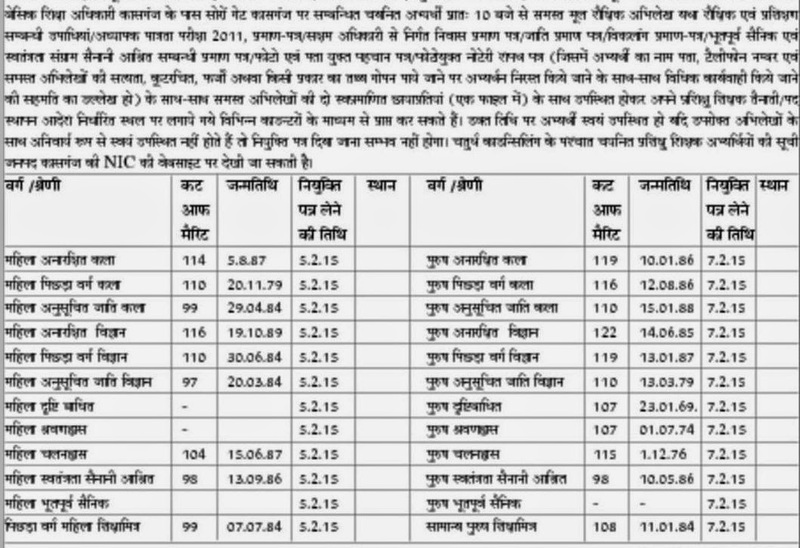 course being run in the State of U.P. The petitioner claims to have passed S.T.C. (two years) Examination-2009 from the State of Rajasthan. Submission is that the said course is equivalent to B.T.C. course being run in the State of U.P. The contention is that as per the notification issued by NCTE, the training qualification of the petitioner is to treated as equivalent to BTC course. The petitioner has successfully completed T.E.T. Test-2011 and is fully eligible for appointment on the post of Assistant Teacher. The petitioner made an effort to submit on-line application form as against the 15,000 vacancies notified pursuant to the Government Order dated 9.12.2014 for primary schools being run by Basic Shiksha Parishad. Submission is that the qualification prescribed by the NCTE is to be followed for the purpose of appointment of Assistant Teacher. The question as to whether the training qualification possessed by the petitioner is equivalent to B.T.C. is subject matter of consideration. Learned Standing Counsel appears for respondent nos. 1, 2 & 4 and Sri A.K. Yadav, learned counsel for respondent no. 3. All the respondents may file counter affidavit within four weeks. Two weeks, thereafter, for filing rejoinder affidavit. In the meantime, the petitioner's application form be accepted and he shall be allowed to participate in the counselling. However, the appointment of the petitioner, if any, shall be subject to the final outcome of the writ petition. The qualification for appointment on the post of Assistant Teacher in Junior High School (Class VI to VIII) for Mathematics and Science is one of the subject in the Graduation and Intermediate in Science. He did Bachelor of Business Administration (B.B.A.) from the Chaudhary Charan Singh University, Meerut. Science and Mathematics was not subject� at the graduate level and hence the claim of the petitioner for appointment on the post of Assistant Teacher in Science/Mathematics for Class VI to VIII cannot be accepted. The petitioner does not possess the minimum eligibility. Heard learned counsel for the petitioner, Sri Harendra Yadav, learned counsel for the respondents no. 4 and 5 and learned Standing Counsel for the State respondent. The present writ petition has been filed for a direction to the respondents to issue letter of appointment to the petitioner to the post of Trainee Teacher in Primary School, Sonebhadra. It is contended by the learned counsel for the petitioner that the petitioner, being eligible and qualified, had applied for being appointment as Trainee Teacher in Primary School pursuant to the advertisement dated 30.11.2011 and 20.12.2011, however, selection process was stopped on account of litigation pending before Hon'ble Apex Court and ultimately same took place and petitioner participated in counseling process and his counseling was done and his original documents were verified and direction was issued to him to deposit the photocopies of the entire documents in the office for the purpose of issuance of letter of appointment.� The petitioner was informed that he was selected and appointment letter will be issued between 19.1.2015 to 26.1.2015, however, no appointment letter has been issued to the petitioner inspite of the fact that he was duly selected and all papers were verified by the counseling committee.� It is also contended that the petitioner approached the respondent no. 5, where he was informed that since he did not secure 40% marks in B.A. and has got only 39.61%, therefore, no appointment letter can be issued to him.� It is further contended that at the time of counseling this question arose but the counseling committee treated 39.61% marks as 40% on the principle of round up and therefore, original documents of the petitioner were verified, therefore, reason, which is given for non-issuance of appointment letter of the petitioner, cannot be sustained. Learned counsel for the respondents no. 4 and 5 prays for and is granted one week time to verify as to why the appointment is not issued to the petitioner. Accordingly, put up on 11th February, 2015 before the appropriate Bench, by which time learned counsel for the respondents no. 4 and 5 as well as learned Standing Counsel shall obtain instructions in the matter. Respondent :- State Of U.P. Through Prin. Secy. Basic Edu. Lko. & Ors. Petitioner himself is present. He states that he would argue the matter himself and not through the Advocate. In view of the above, vakalatnama of learned counsel for the petitioner is discharged. Heard petitioner in person and learned Standing counsel for the respondents. Petitioner is seeking a direction upon the respondents to permit him to appear for selection on the post of Assistant Teacher in primary school in pursuance of the government order dated 9.12.2014 and the advertisement dated 13.12.2014. The submission of learned counsel for the petitioner is that he is qualified to apply for the post of Assistant Teacher in primary school but his application is not being entertained for the reason that he had obtained training qualification from the State of Madhya Pradesh and not from Uttar Pradesh. The advertisement dated 13.12.2014 is annexure 1 to the writ petition. It clearly provides that for the post of Assistant Teacher, a candidate must possesses two years BTC, BTC Urdu or Vishistha BTC apart from other conditions. The petitioner does not possess any of the above training certificates. The petitioner contends that he has obtained a certificate of two years diploma in education(D.Ed) in the year 2013 from Swami Vivekanand College of Profession, Chatri Road, Shivpuri, Madhya Pradesh and therefore he possesses the necessary qualification for the post of Assistant Teacher. The U.P. Basic Education (Teachers Services) Rules, 1981 lays down the essential educational qualifications for appointment of the Assistant Teacher. Rule 8 of the above Rules provides that a candidate for Assistant Teacher must possess a bachelor decree from an University recognized by law in India or an equivalent decree thereof together with training qualification consisting of Basic Teachers Certificate (BTC), Vishistha BTC, two years BTC (Urdu), special training course, Hindustani Teachers Certificate, Junior teachers Certificate, Certificate of teaching or any other training course recognized by the Government as equivalent thereof. The petitioner does not possess any of the above training qualification and at the same time diploma of education certificate possessed by him has not been recognized by the U.P. Government as equivalent to any of the above qualifications. In view of the aforesaid facts and circumstances, it can not be said that petitioner is qualified to apply for the post of Assistant Teacher as advertised. In case the government decides about the eligibility condition and lays down for a specific qualification, the Court can not interfere with the said policy decision unless it is in violation of any statutory or constitutional provision. Accordingly, holder of the diploma in education certificate was not recognized as eligible for the post of Assistant Teacher. In view of the above, I find no merit in the writ petition and it is dismissed. UPSESSB TGT Exam paper solution 01-02-2015 provide to download at website. 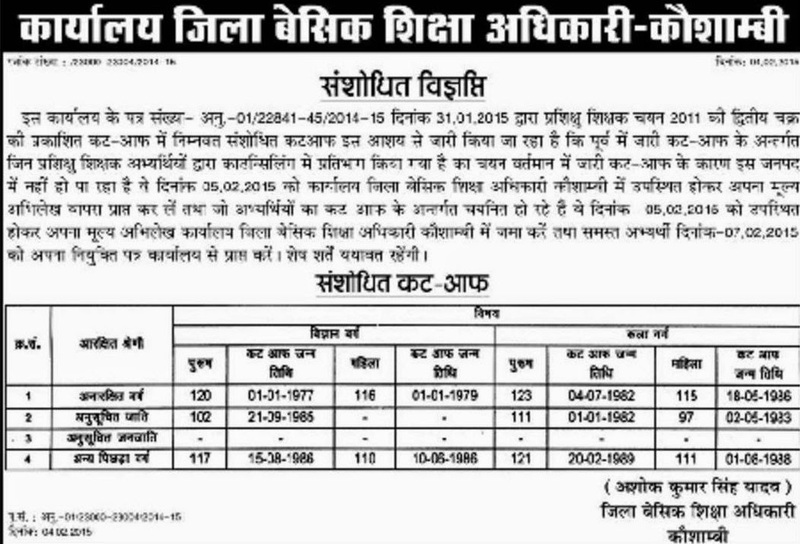 Uttar pradesh secondary education service selection board(UPSESSB) will announce solution/answer key of trained graduate teacher written exam held on 01-02-2015 in A set, B set, C set, D set wise format along cut off marks on official website. Applicants who have participated in this exam are able to download their solved question paper. 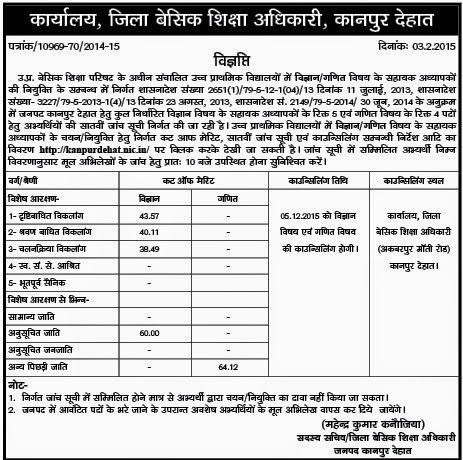 Uttar pradesh secondary education board has issued 7140 vacancies of trained graduate teacher(TGT) and post graduate teacher(PGT) posts in form of UPSESSB TGT PGT Recruitment2015 on its website. Candidates who are interest in exam by submit their application form before last date. 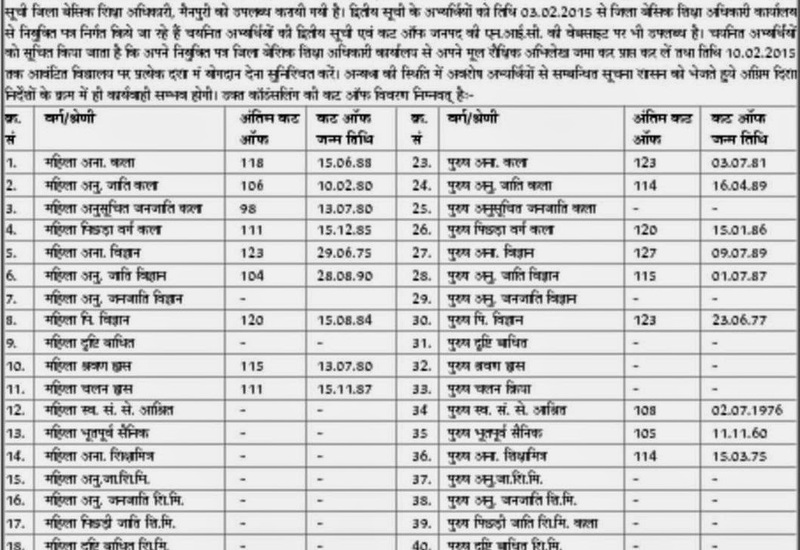 UP TGT Exam date is 25-01-2015,01-02-2015 & 08-02-2015,UP PGT Exam date is 15-02-2015 & 22-02-2015. 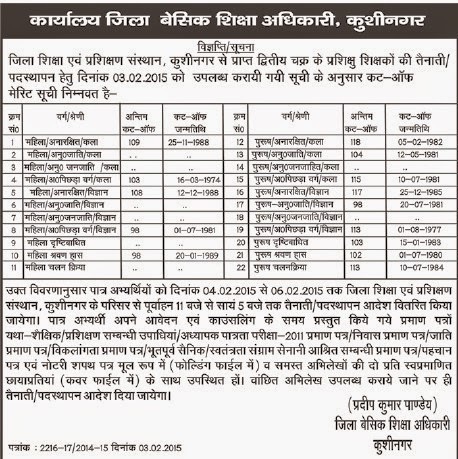 Finally UPSESSB Trained graduate teacher TGT 2015 exam held on 02-01-2015 at various centres of U.P. UP TGT Exam Date is : 25th Jan 2015, 1st Feb 2015 & 08th Feb 2015. 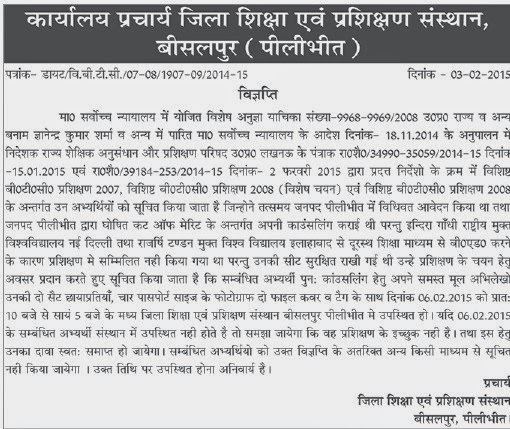 UP PGT Exam Date is : 15th Feb 2015 & 22nd Feb 2015. UPSESSB Trained Graduate Teacher TGT 2015 examination held successfully on 2 jan 2015 at several examination centres across the U.P state. After successful completion of exam, applicants are willing to see UPSESSB TGT Answer Sheet 2015 Or UP TGT Paper Solution 2015. Enter official website: www.upsessb.org – UPSESSB TGT PGT. Next choose on UPSESSB TGT Answer key 2015 link. Your UP TGT 2015 answer key will open. Check your answer and assumed your marks. to and you are just too great. I have done my graduation and I am looking for the latest government jobs vacancy. Please provide some information regarding the same. and please provide a link to check NPCIL Result online. Are you looking for the Rajasthan Govt. Jobs? If you are, then you have come to the right place. Our website is a one- stop place for the candidates who are willing to apply for Rajasthan Govt. Jobs can visit here.